I’m going to be a little bit direct in today’s email, so excuse my blunt approach…but I feel it is vitally important as it surrounds the reality that is betting for profit and the difference that genuine expert advice can make. To help explain my point – I want to discuss first of all the generally accepted statistic that approximately 1.5% of all punters who bet actually make a profit from their betting. Or to put it another way just 1 person out of every 75. Whichever way you look at it – it’s a fairly damning statistic and one which goes to show how difficult it is to win when betting, especially when doing so on your own. If, however, you then compare this 1.5% stat to the results of our 2016 Awards Report, whereby 85.1% of all voting SBC members made a profit from their betting in 2016, I think you might be able to see the point of this email. What’s more this 85.1% figure is a 1.5% increase on the same question from last year, indicating a gradual improvement on performance figures obtained by SBC members. To find out just how much profit the 85.1% who voted made, we also asked them to categorise just how much they were up or down in 2015. It turns out that the most popular profit category was for those making £10,000+ profit with 28.7% of all who voted making this five figure sum. Next up was those up between £5,000 and £9,999 profit with 17.6% falling into this category. Combining these top two categories effectively meant that 46.3% of all who voted actually made a minimum of £5,000 profit last year. Not bad at all. As much as we would love every single one of our members to make a profit, let’s be realistic. Not everyone is going to make it work. As a member we give you all the tools you need to make a profit, but it still comes down to your discipline, perseverance and yes, a little bit of luck. Still, 85.1% of SBC members compares very nicely to the 1.5% general public stat and just goes to show the difference that our tipster reviews and ratings can make. All of the results in this email were based on a straight-forward poll where we asked SBC members to honestly answer just how their betting fared last year. Each member could only vote once and no incentives were offered for answers to ensure they were 100% fair and accurate. 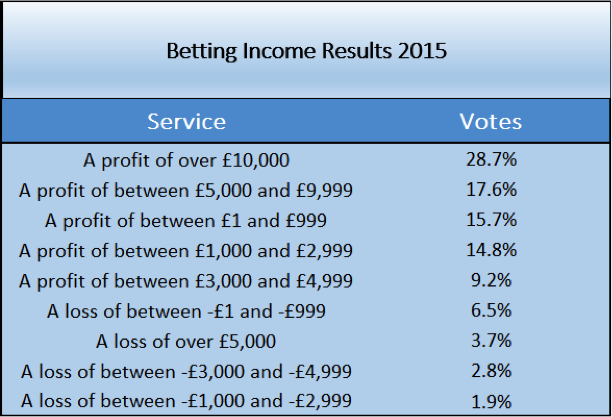 The full results of this poll have been published in our 2016 Betting & Tipsters Award Report, where as a service we took the pulse of just how last year fared for our members. If you are keen to follow in the footsteps of some of our members and vastly increase your chances of making a profit from your betting, then do consider a Smart Betting Club membership. You can also sign-up today and enjoy the peace of mind that our 30 day 100% money back guarantee will bring you – ensuring you have everything to gain and nothing to lose.